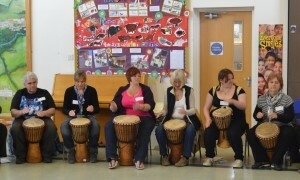 DRUM It Up is a community education organisation, which has gained funding from Somerset Skills and Learning through the Skills Funding Agency. The organisation is run by Frome women Tanya Sherriff and Katie Harris, both musicians with a background in community and youth work and social work, and who have a wide range of experience of running therapeutic, musical, and educational projects. Drum It Up uses creative and innovative methods to engage new learners and guides them through a 14 week process which is really supportive and fun! Drum It Up will be running their hugely successful 14 week ‘Making Tracks’ course at the Bridge Children’s Centre, (next to Haysdown School) Wyville Road, Frome (BA11 2BN) starting on Wednesday 20th February, 12.45 – 2.45pm, term time only. This free course is for adults who have had a negative experience of education and who are lacking the confidence and belief in themselves to take that scary step into further education. Drum It Up use innovative and varied tools including African drums, percussion and singing, alongside established models of confidence building from extensive research and experience. This framework has encouraged personal development and positive change, while keeping the importance of a safe, enabling and inclusive environment at the forefront. A free crèche will be running alongside the course so parents with young children can attend without worrying about childcare. It is a really fun course and if you have ever fancied trying African Drumming or taking that first step onto a course then this course is for you! No musical experience needed and all the equipment is provided. Drum It Up is run by Tanya and Katie and is a social enterprise, they run drumming/confidence building courses, children’s birthday parties (all drums and equipment provided) and play schemes; will run drumming sessions at all events (weddings, anniversaries, festivals etc) and run corporate team building events, tailoring workshops to meet your needs. Contact them through drumitupsomerset@googlemail.com – drumitup.co.uk. Give Katie a ring on 07590 381453 or Tanya on 07941 248621 to book your place.